Thompson Creek Gutters: Why We Are the Best Choice? Blog General	What makes Thompson Creek Window Company the best choice for replacement gutters? 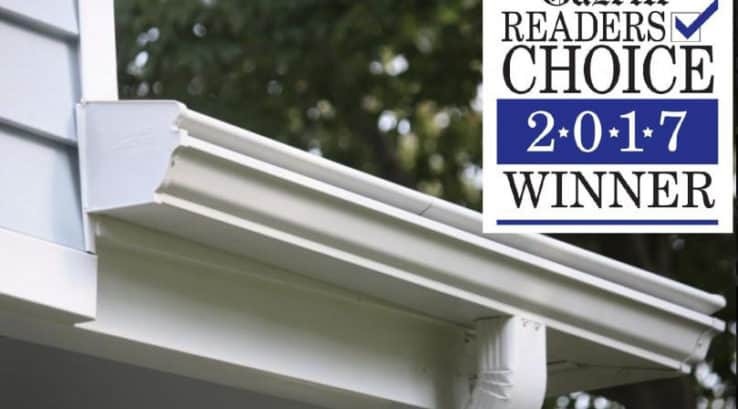 We recently won the title of Best Gutters in the Capital Gazette. It was an honor to receive the award. We want to take a moment to share what our customers can expect when they choose our company and our award-winning gutter system. When a homeowner calls Thompson Creek for gutters, we respond with knowledge of not only the gutter system, but the entire home. As home remodeling experts, we can also provide solutions to common household issues. Our innovative system will protect your home for years to come. If this sounds good, GET MY PRICE ON GUTTERS. The need for replacement gutters is never more obvious than during a rainstorm. Leaves and debris can clog gutters, leading to water overflow which can pool below near the foundation of the home. This can cause foundation issues, damage landscape, or leak into basements. Fixing the symptom by shuffling around mulch or clearing out the gutters is not a long term solution. Here are the top 5 reasons why customers love our gutters. Free from hassle – spend less time at the top of an unsafe ladder. A simple power wash once a year ensures our gutters perform their best. Our gutters are available in 16 colors to complement your home. No gutter problems – our seamless system never pulls away. These gutters are free-flowing and will remain clog free. If the unexpected happens and something gets in, call us and we will fix it. Protects your home from weather damage – a faulty gutter system can wreak havoc below. Our gutters are tested to withstand rainfall from a Category 4 Hurricane. “I had new gutters, three windows, and entry and storms done and all of it is awesome, crews were fantastic, prompt clean professional everything smooth.” -Robin P.
“I was most satisfied with the presentation of the model itself, and the person I signed the paperwork with. I have a brand new roof, gutters and siding.” – James G.
“They did a great job, quality product. I had gutters done and when we had a storm my neighbors was flowing down all over and mine was as smooth as butter. If you don’t have them, you should get them.” – David H.
“Both the roofing and gutter crews were great. They were efficient, swift and skilled.” – Jim B.